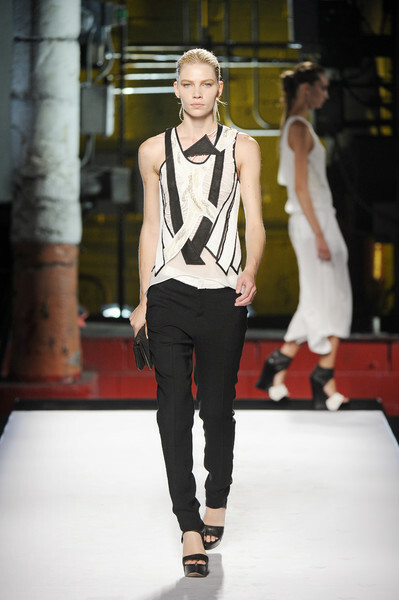 The label Helmut Lang is back. Brought back to life by Nicole Colovos and her husband Michael. Richard Serra was the inspiration for their ss2012 collection, with lots of black, white and bright yellow, draping, layering and angular hemlines. The couple worked five years at Helmut Lang and this is their first catwalkshow. In the meantime they’ve built a real business on the consistency of their clothes’ cool, urban vibe: lots of black, lots of leather, a sharply cut blazer and slouchy T-shirts.